What is a Low Temperature Freeze Alert Device? When the weather gets cold, bad things can happen with pipes and such. Thankfully, there are devices that offer low temperature freeze alerts, helping make sure things get shut off before they burst, break, or do terrible damage. In order to protect homes, valuables and property, it makes sense to utilize low temperature freeze alert devices. These sensors indicate when the temperature falls to a point where people would be concerned for the well-being of other people, such as elderly people who can’t handle extremely cold temperatures, as well as livestock and pets. These sensors are also used in greenhouses in order to protect vulnerable plants, too. And, of course, these sensors can ensure water valves get turned off before problems occur. Oftentimes, low temperature sensors are part of home security systems. They can be hardwired or wireless and set to “go off” if and when the temperature reaches a specific range that’s pre-programmed as a concern. Typically, when the temperature gets too cold for comfort, an audible alarm will sound alerting those in earshot. Some systems connect to monitoring systems, and may involve a phone call, text alert or even email indicating the room, space or area’s temperature is in “the danger zone.” Then the person monitoring the alarm can do what’s necessary to prevent people, animals, valuables and/or property from trouble. Low temperature sensors work especially well when they incorporate the ability to shut off water valves when temperatures drop too low. This, in turn, helps prevent pipes from bursting, which could totally ruin a place. FYI: NYCONN Security Systems often installs a WaterCop automatic water shut-off valve system, which provides homes with round-the-clock indoor flood protection. This system works thanks to low temperature sensors. 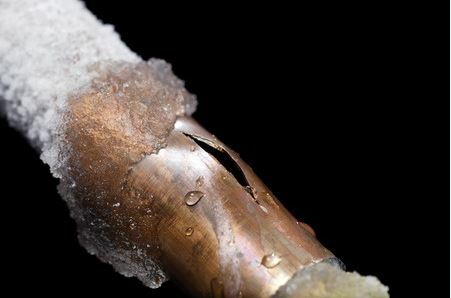 See this page for a picture of what happens when pipes burst because nothing was monitoring the room’s temperature. When you want to make sure your place is safe, secure, and free from problems, utilize NYCONN Security Systems; call 1-800-783-5004 for more information.